The PLCLogix Graphic User Interface (GUI) displays the ladder logic, controller organizer, I/O chassis, and a range of toolbars, tabs, etc. The ladder logic display is the same format as RSLogix 5000, for PLCLogix 5000, and as RSLogix 500 for PLCLogix 500. 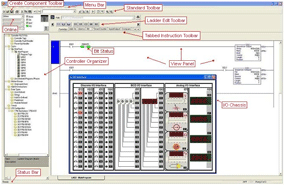 The controller organizer also follows the same convention as RSLogix to provide a seamless transition from PLCLogix simulation to the real-world RSLogix control. The purpose of the GUI is to provide a range of information displayed on a single screen. This information ranges from bit display to program code to status indicators. The Bit Status is represent by green horizontal bars on either side of the I/O device. The bar on the left is referred to as the rung-condition-in and the bar on the right is the rung-condition-out. When the green bars are illuminated, it indicates a high bit (1) is present in the I/O memory location. If the I/O point is not green, it means that a low bit (0) is present at that address. Figure 1-2 shows the main components for the PLCLogix GUI. The Menu Bar provides access to a variety of Windows-based functions including Help, Search, and I/O Chassis. The Create Component Toolbar is used to create new project components. The Tabbed Instruction Toolbar provides category tabs which contain a wide range of instructions in various subsets, or categories. Instructions are inserted into ladder programs by clicking on instructions in the various categories. The Online Bar places the PLC online (Run) or offline (Program). When the PLC is Offline, program edits can be made. When switched to Online, the program is downloaded, and the PLC is in the Run mode. The Standard Toolbar consists of typical edit functions, such as cut, copy, paste that are used repeatedly during the development and debugging of ladder logic programs. The Ladder Edit Toolbar features both common editing functions as well as more specialized edit capabilities. The Controller Organizer is a graphical representation of the contents of your controller project. The Status Bar provides prompts during software operation as well as on-going status information updates. 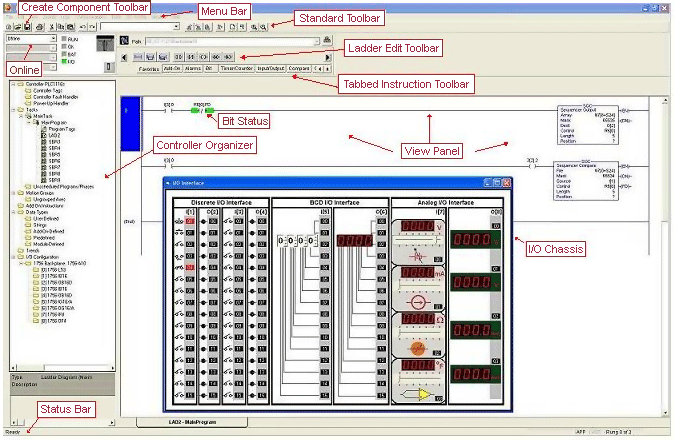 The View Panel is the window which contains the ladder logic diagram and various editors, such as Tag Editors and Data Type Editors.